Drop by the atrium and South Learning Commons of the Killam Memorial Library to see the exciting displays about science being put on as part of Science Literacy Week. Participants include the Natural History Museum, the Canadian CubeSat Team (part of the Canadian Space Agency), the GIS Centre, and our 3D printing team. Display day is just one day of Science Literacy Week, a national celebration of science taking place this year from September 17th – 23rd. Visit the Killam Library throughout the week to see the book display and posters. 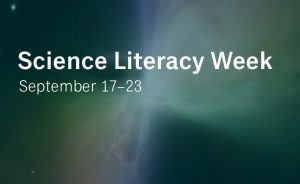 Get some free swag courtesy of the Science Literacy Week team. It’s time to get excited about science! Wednesday September 19, 11 a.m.–4 p.m.